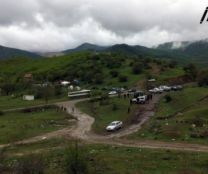 TBILISI, DFWatch–Saturday, there was a scuffle between a journalist and guards working for RMG Gold, a Russian mining company digging in a prehistoric cave complex in the south of Georgia. RMG Gold issued a statement saying that their guards were confronted by a certain group of people who despite a warning scolded the guards and got involved in a physical scuffle with them. “As a result of the incident, three employees of RMG guard were injured,” it reads, adding that the company carries out mining work in Sakdrisi by following the laws. Journalist Nino Mikiashvili says that she was on the property of Sakdrisi Gold mine for several hours, but RMG Gold guard forced her down. She said she wanted to see the historical mine on her own and witness what was happening there, when the guards noticed her and several other people with her and tried to force her to leave. She called on them to call for the police if she was violating the law. “Then one of the RMG employees approached, took my photo camera. I yelled that the camera was not mine, but belonged to Obiektivi TV,” she said, adding that he returned the camera in 15-20 minutes, saying that he deleted photos, but in fact he didn’t. Meanwhile, students, environmental activists and others are continuing to keep watch at the entrance of the Sakdrisi mine, where they have been working shifts and sleeping in tents since April 14. Representatives of the group Green Fist told DF Watch that they plan to continue the protests until RMG Gold stops mining work at Sakdrisi and lets local and foreign experts research the place and publish a report. According to scientists, Sakdrisi has more than 5,400 years old archaeological traces of humans and RMG Gold is destroying the historical heritage.